Remarks: Vigorous vines with many side branches. - Plants are strong sturdy vigorous creeper. - Fruits are cylindrical in shape and green in colour. - Fruits are 10 - 12cms long. - First harvest start from 40 - 50 days after sowing. 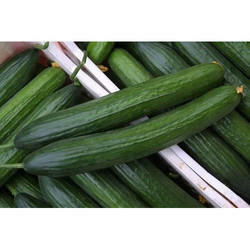 An excellent Selection variety of cumber, dark green color and long size fruits, maturity time 38-40 days, high yielding. Finely cleaned these Cucumber Seeds are offered to the customers to make different sweets. These seeds are best in working and free from fungal and bacterial effect. These seeds are quality checked by food inspector to let consumers have best seeds. In addition to this, we offer these cucumber seeds in different packets. ITS organic vegitable without any spray.Hi tech.i produce 48 ton cucumber in 3 months. - Vigorous vine with dark green leaves and good branching bear Straight and uniform cylindrical shaped light green fruits with dark green shoulder. - Early maturity, fruits are ready for harvest after 38-40 days of sowing. - The average fruits is 18-22cm long with 4-5cm diameter & 200-250 gm weight.